Received August 23, 2018; Revised September 14, 2018; Accepted September 14, 2018. The objective of this study was to describe the influence of smartphone usage on the upper limb muscles while in stable and unstable positions and during gait. The study was conducted with 20 right-handed university students between 20 and 27 years of age. Experiments were carried out on students who have used cell phones for more than a year. In this study, experiments were performed with one-handed and two-handed smartphone operations while on stable ground, and the same parameters were measured during smartphone use on unstable ground and during gait. Subjects were instructed to write a text message in Korean on the smartphone for 3 minutes. This was repeated 3 times, with a rest period of 10 seconds given between each 3-minute period. 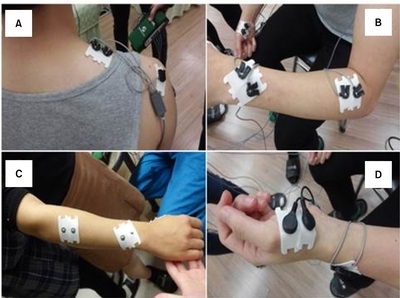 Electromyography was used to record the muscle activity of the upper trapezius, extensor carpi radialis, extensor pollicis longus, and abductor pollicis (AP) during phone operation. The muscle activity value for the right AP in one-handed and the left-AP in two-handed operations was statistically higher than the other muscles in the stable position and during gait (p<0.0001). Also, the right AP in the onehanded operation condition was statistically higher than the two-handed condition (p<0.0001). The use of smartphones while in a stable position resulted in high muscle activity of the right upper limb AP. However, in an unstable position, there were no significant differences from the other muscle activities. Using smartphone while assuming various positions may lead to musculoskeletal disorders in different places. With the convenience of and high penetration of smartphones, people tend to keep their smartphone in their hands, regardless of time and place . For example, people often use their smartphone while waiting for public transportation, on a shaking bus or subway, or while walking. Unfortunately, excess smartphone usage while riding a shaking vehicle can lead to rigidity of the shoulder muscles, which causes pain and fatigue and continuous burden on the hands and wrists [2,3]. When people use their smartphones, they move their arms more and extend them relatively longer than when using a keyboard. For this reason, it was reported that when people used a touch screen based computer, they felt neck and shoulder fatigue more quickly, and the loads on their neck and upper extremities and pain in the thumbs (the flexor pollicis longus) increased [4-6]. Relevant research on smartphone use was mostly focused on assessing muscle activity in stable positions, such as sitting or standing. Therefore, there is an important need for research comparing smartphone use on stable and unstable positions. Although numerous physical problems from smartphone use has been investigated, there is little research on muscle activity in unstable positions, such as during use of public transportation. Therefore, this study investigated the muscle activity of the upper extremities during smartphone usage not only in stable positions, but also in unstable positions, which trigger passive movements, such as on a bus or subway, and during gait. Specifically, we compared and analyzed changes in muscle activity of the upper extremities during one-handed or two-handed smartphone usage while in a stable standing position, an unstable standing position on shaking ground, and during gait. Between February 1 and February 28, 2018, we conducted an experiment with the consent to research 20 right-handed college students who use a smart phone. We recruited people who had been using smart phones for greater than one year. This research was a non-blinded, cross-sectional study. All subjects were between 20-27 years of age. The mean heights of the male and female subjects were 174.5 cm and 160.9 cm, respectively. The mean body weights of the male and female subjects were 67.7 kg and 52.1 kg, respectively (Table 1). Exclusion criteria were 1) any limitations in upper extremity movement or a history of upper extremity orthopedic and neurological problems in the past 6 months and 2) had a positive Phalen’s or Finkelstein test [7,8]. This study was approved by the Institutional Review Board of Sahmyook University (IRB No. 2-1040781-ABN-01-2018137HR). The smartphone used in this study was made by S Company. The muscle activities of their upper extremities were measured while the users typed characters on their phones for 10 minutes. This study analyzed the smartphone users’ upper extremity muscle activities during smartphone use on stable ground, unstable ground, and while walking, including during one-handed and two-handed use in each position. In each condition, the users performed the task of writing the first verse of the national anthem on the smartphone for 15 seconds three times. Between each repetition, they were given a five-second break. The QWERTY keyboard was used, and the auto complete function was not used. The experimental time per user was approximately 20 minutes. During smartphone use on stable ground, the participant dropped their neck naturally to maintain a neutral position and moved the elbows and wrists to a neutral position. During one-handed use, the participant did not use their non-dominant hand and held their smartphone with their dominant right hand. The study participant did not speak during the experiment. For smartphone use on unstable ground, a dynamic air cushion (Dynair Deco ball cushion; Togu, Deutschland, Germany) was used to create instability. The participant maintained a neutral position of the neck, elbows, and wrists, just as they did on the stable surface. In order to maintain balance while on the air cushion, the participant attempted to position their body near the center as much as possible. After performing the test on the air cushion for 15 seconds, a participant rested for 5 seconds. This process was repeated three times. During smartphone use while walking, the participant again maintained a neutral position of the neck, elbows, and wrists just as they did in the standing position. An evaluator held the electromyography (EMG) on the back of the participant and they walked together. The participant was asked to walk as usual and to not talk. The test was performed for 15 seconds, then the participant turned and rested for 5 seconds. This process was repeated three times (Figure 1). In this study, the electrodes were applied onto the upper trapezius (UT), extensor carpi radialis (ECR), extensor pollicis longus (EPL), and abductor pollicis (AP) (Figure 2). For the UT, a pair of electrodes was attached 2 cm from the middle point between the seventh cervical vertebra (C7) process and the acromion, in line with the shape of the muscle fibers. In case of the ECR, the forearm lay prone and a pair of electrodes was attached to the point 2 cm below the bend of the forearm. In case of the EPL, a pair of electrodes was attached to the position proximately 4 cm above the wrist, at an oblique angle. In case of the AP, a pair of electrodes was attached above the muscle belly in parallel with the muscle fibers. The maximum voluntary isometric contraction (MVIC) was used to find the ratio of the muscle activity. Before the test, the MVIC was measured. After the MVIC measurement, a test was conducted in which the order of positions was randomly selected. This study used the Noraxon EMG System (Noraxon USA Inc., Scottsdale, AZ, USA). EMG signals were sampled at 1,000 Hz and band-pass filtered between 20-450 Hz. The root-mean-square (RMS) of the signal was calculated and was normalized to the maximum voluntary contraction (MVC) . The EMG data in this study demonstrated reliability, as well as inter-examiner reliability, especially the reliability of the tester . In addition, the dynamic experiment displayed a better intraclass correction coefficient (≥0.75) . Using surface electromyography (sEMG), the sensitivity and accuracy of dynamic movements were about 88.8%; therefore, 81.3% of the results were meaningful . All of the electrode sites on the subjects were cleaned using alcohol swabs before attachment to the EMG. While executing the experiment, the muscle activities of the UT, ECR, EPL, and, AP were measured using the EMG [9,13-17]. In this study, the electrodes were attached to the trapezius muscle, upper limbs and the muscles of the hand of the subject. The ground electrode was accurately attached to the C7 process, and the UT electrode was attached 2 cm lateral from the middle point of the C7 process and acromion. The ECR electrode was attached 2 cm below the elbow with the forearm in the prone position. The electrodes that were attached to the two muscles were positioned as illustrated in the sEMG manual . The EPL electrode was attached 4 cm up the wrist, and the AP electrode was attached on the muscle belly, parallel with the muscle fibers (Figure 3) . The same test was conducted by the researcher three times each for 5 seconds in order to determine the reliability of the MVC. The UT, ECR, EPL, and AP electrodes measured shoulder elevation, wrist extension, thump extension, and thumb abduction, respectively. After MVC measurement, the positions were measured in random order. Experiments were 3 minutes in duration and were repeated 3 times. Average values were calculated and converted into % MVC. The ground electrode was placed at the C7. EMG signals ranged from 20-450 Hz. The RMS of the signal was calculated and was normalized to the EMG data MVIC . All statistical analyses were performed using IBM SPSS Statistics ver. 19.0 software (IBM Co., Armonk, NY, USA). A one-way ANOVA with repeated-measures were used to compare positions, and an independent t-test was used to compare one-handed and two-handed use. A post-hoc analysis was conducted using the Scheffe test. The statistical significance level was set to α=0.05. Analyzing the myoelectric data of all 20 people, the muscle activities of the right (R)-UT, R-ECR, R-EP, R-AP, L-ECR, L-EP, and L-AP were significantly different in the stable position, except for the left (L)-UT (p<0.0001). In the unstable position, muscle activities of the R-AP, L-ECR, L-EP, and L-AP muscles were significantly different. During gait, the R-ECR, R-EPL, R-AP, and L-AP were significantly different (p<0.05) (Figures 3-5). Muscle activities of the AP were significantly different during right one-handed use (p<0.0001). Muscle activities of the ECR and AP were significantly different during right double-handed use (p<0.05). 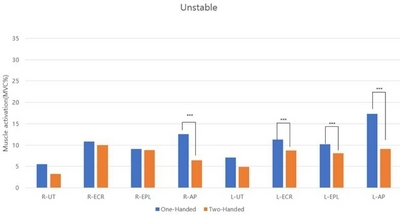 Additionally, muscle activities of the ECR and AP were significantly different during left one-handed use (p<0.05) (Tables 2, 3). The subjects of this study were university students who use smartphones. This study attempted to uncover differences in upper extremity muscle activity during smartphone use in a stable standing position, an unstable standing position, and during gait. When the participants performed the test using only their right hand, the muscle activity value for the AP while in the unstable position was statistically lower than that in the stable position and during gait. The muscle activity values for the UT and EPL, but not the ECR, were also lower in the unstable position. The ECR muscle had the highest muscle activity value during gait. This result is consistent with those found in a previous study , which found that muscle activity of the AP was the highest in standing position. Muscle activities of the UT, ECR, EPL, and AP were compared. We found that all muscle activities were almost constantly activated at a similar level in the unstable position, compared to the stable position and during gait. Also, muscle activity with one-handed use was greater than two-handed use. This finding seemed to be due to the unstable position created by use of the dynamic air cushion. In this test, the ground was unstable, unlike in the stable position and during gait, where the subjects’ feet were on the ground. When both feet are not firmly on the ground, there is a lack of somatosensory input. This lack of information directly causes failures, such as a fall, and influences the ability to achieve even weight distribution, making it difficult to maintain a correct position [19-21]. Therefore, the proximal muscle of the upper extremity also appeared to be active in order to secure the stability of the position. Our result is different from the result of a previous study , which did not describe any influence on the AP position, but only measured movement of the hands. In Kim’s research , both positions used (standing and sitting positions) were stable, whereas in this study, stable positions were compared with an unstable position. This difference in experimental design explains the differences in our results. In this study, measurements while in an unstable position were taken on unstable ground, whereas measurements during gait were taken on stable ground, just as with those taken in the stable position . For this reason, tests performed during gait and in a stable position generated similar results. 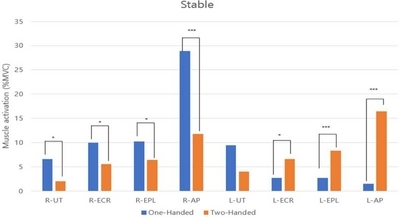 When participants performed the test using only their left hand while in the stable position, muscle activity values were reduced, in the order of UT, ECR, EPL, and AP. During gait, the muscle activity value for the ECR compared to UT was slightly increased, and the muscle activity values for the EPL and AP were reduced. However, in an unstable position, the muscle activity value for the EPL compared to ECR was slightly decreased, but the muscle activity value for the AP was remarkably increased. This result is consistent with those from a previous study  on wrist patterns associated with stable and unstable mechanical loads, which found that the muscle activity of the wrists associated with unstable loads was greater than that associated with stable loads. Also, while such ‘fixed support’ balancing reactions are important in providing an early defense against loss of balance, it has become clear that the capacity to avoid falling is likely to be highly dependent on a second, fundamentally distinct type of balance control, which involves rapidly moving the limbs so as to alter the BOS . The muscle activities of the right and left upper extremities, except for L-AP, tended to be similar in the stable position and during gait. When one hand was used, there was a difference between the right and left upper extremities. The AP muscle activity in all positions was analyzed. While in an unstable position, when only the left hand was used, the AP muscle activity was remarkably increased compared to when the right hand and both hands were used. It was presumed that, when one hand was used, the user’s left upper extremity was not fixed when not holding a smartphone and was used for maintaining the position. 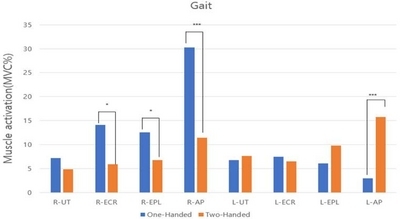 In a stable position and gait (Figures 3, 5), the muscle of the right upper extremity was more active when one hand was used than when both hands were used. All muscles, except for the UT muscle of the left upper extremity, were highly active when both hands were used. Just as in the stable position, smartphone use during gait showed a similar pattern of muscle activity. In an unstable position (Figure 4), the muscle activity of the right upper extremity was higher than that of the left side when one or both hands were used. When one hand was used, the activity of the right AP muscle was lower than that of the left side. Hsieh et al. reported that securing the stability of the trunk helped to increase a level of functional execution of the upper extremities and to improve activities of daily living. Human being able to maintain a stable posture to receive ordinary somatosensory inputs as it has only insufficient feeling of acceptance from the foot when not supporting the foot on the ground . It is presumed that it is impossible to use a smartphone efficiently in an unstable position, compared to a stable position or during gait. Therefore, it will be offered to musculoskeletal disease region according to stable position, unstable position, and gait. The purpose of this study was to investigate the relationship between the use of a smartphone and muscle activity in a stable position, an unstable position, and during gait. We identified significant relationships in our study, which we hope will serve as basic data on the relationship between musculoskeletal diseases and using smartphones in various positions. In conclusion, this study, we investigated the influence of smartphone use in stable and unstable positions and during gait on the upper limb muscles. The use of smartphones while in a stable position resulted in a high activity of the right upper limb AP, but in an unstable position, it showed no difference from other muscle activities. However, in the left upper limb, the AP showed high activity even when not holding the smartphone, and when both hands were used, the muscle activity of the AP was lower than that in the other positions. However, it is difficult to apply our findings to the general population because we conducted the study on subjects in their twenties. Therefore, future studies should include subjects from a wider age range. Fig. 1. Various positions when using smartphone. (A) Stable position. (B) Unstable position. (C) Gait. Fig. 2. Electromyography attachment sites. (A) Upper trapezius. (B) Extensor carpi radialis. (C) Extensor pollicis longus. (D) Abductor pollicis. Fig. 3. Comparison of muscle activities of one-handed and double-handed smart phone use in stable position. %MVC: % maximum voluntary contraction, UT: upper trapezius, ECR: extensor carpi radialis, EPL: extensor pollicis longus, AP: abductor pollicis. Significant difference between One-handed and Two-handed use. *p<0.05, ***p<0.0001. Fig. 4. Comparison of muscle activities of one-handed and double-handed smart phone use in unstable position. %MVC: % maximum voluntary contraction, UT: upper trapezius, ECR: extensor carpi radialis, EPL: extensor pollicis longus, AP: abductor pollicis. Significant difference between One-handed and Two-handed use. ***p<0.0001. Fig. 5. Comparison of muscle activities of one-handed and double-handed smart phone use in Gait. %MVC: % maximum voluntary contraction, UT: upper trapezius, ECR: extensor carpi radialis, EPL: extensor pollicis longus, AP: abductor pollicis. Significant difference between One-handed and Two-handed use. *p<0.05, ***p<0.0001. Values are presented as mean (% maximum voluntary contraction). UT: upper trapezius, ECR: extensor carpi radialis, EPL: extensor pollicis longus, AP: abductor pollicis. Significant difference between one and two-handed use. Significant difference, ANOVA test: stable, unstable and gait. TNS & KT, (2016). Economic Research Institute, Smartphone penetration. 2016, 48. Ming, Z, Pietikainen, S, and Hänninen, O (2006). Excessive texting in pathophysiology of first carpometacarpal joint arthritis. Pathophysiology. 13, 269-70. Szeto, GP, and Lee, R (2002). An ergonomic evaluation comparing desktop, notebook, and subnotebook computers. Arch Phys Med Rehabil. 83, 527-32. Shin, G, and Zhu, X (2011). User discomfort, work posture and muscle activity while using a touchscreen in a desktop PC setting. Ergonomics. 54, 733-44. İnal, EE, Demİrcİ, k, Çetİntürk, A, Akgönül, M, and Savaş, S (2015). Effects of smartphone overuse on hand function, pinch strength, and the median nerve. Muscle Nerve. 52, 183-8. Gilman, L, Cage, DN, Horn, A, Bishop, F, Klam, WP, and Doan, AP (2015). Tendon rupture associated with excessive smartphone gaming. JAMA Intern Med. 175, 1048-9. Kim, KS, Lee, SW, Choi, YH, and Jin, MR (1998). Carpal tunnel syndrome among service and manufacturing workers with repetitive motion tasks. Ann Occup Environ Med. 10, 505-23. Kutsumi, K, Amadio, PC, Zhao, C, Zobitz, ME, Tanaka, T, and An, KN (2005). Finkelstein's test: a biomechanical analysis. J Hand Surg Am. 30, 130-5. Lee, M, Hong, Y, Lee, S, Won, J, Yang, J, and Park, S (2015). The effects of smartphone use on upper extremity muscle activity and pain threshold. J Phys Ther Sci. 27, 1743-5. Keun, YC (1989). A study on the reliability of EMG examination using EM2. Taehan Chikkwa Uisa Hyophoe Chi. 27, 149-54. Geisser, ME, Ranavaya, M, Haig, AJ, Roth, RS, Zucker, R, and Ambroz, C (2005). A meta-analytic review of surface electromyography among persons with low back pain and normal, healthy controls. J Pain. 6, 711-26. Xie, Y, Szeto, GP, Dai, J, and Madeleine, P (2016). A comparison of muscle activity in using touchscreen smartphone among young people with and without chronic neck-shoulder pain. Ergonomics. 59, 61-72. Kim, CM, Park, JH, Kim, GH, and Son, K (2011). A comparative evaluation about force and fatigue on thumb according to input type for repetitive use of mobile phone. J Biomed Eng Res. 32, 312-8.
von Tscharner, V, Barandun, M, and Stirling, LM (2011). Fatigue-related decrease in Piper rhythm frequency of the abductor pollicis brevis muscle during isometric contractions. J Electromyogr Kinesiol. 21, 190-5. Kim, YL, Yoo, JH, Kang, SW, Kim, TR, Kim, NY, and Hong, SJ (2016). The comparison of muscle activity according to various conditions during smartphone use in healthy adults. Phys Ther Rehabil Sci. 5, 15-21. Chaudhuri, S, and Aruin, AS (2000). The effect of shoe lifts on static and dynamic postural control in individuals with hemiparesis. Arch Phys Med Rehabil. 81, 1498-503. Hamman, RG, Mekjavic, I, Mallinson, AI, and Longridge, NS (1992). Training effects during repeated therapy sessions of balance training using visual feedback. Arch Phys Med Rehabil. 73, 738-44. Ross, SE, and Guskiewicz, KM (2004). Examination of static and dynamic postural stability in individuals with functionally stable and unstable ankles. Clin J Sport Med. 14, 332-8. De Serres, SJ, and Milner, TE (1991). Wrist muscle activation patterns and stiffness associated with stable and unstable mechanical loads. Exp Brain Res. 86, 451-8. Maki, BE, McIlroy, WE, and Fernie, GR (2003). Change-in-support reactions for balance recovery. IEEE Eng Med Biol Mag. 22, 20-6. Hsieh, CL, Sheu, CF, Hsueh, IP, and Wang, CH (2002). Trunk control as an early predictor of comprehensive activities of daily living function in stroke patients. Stroke. 33, 2626-30. Lee, KY, Woo, HS, Chang, KY, and Yoo, HS (2013). Effect of stable supporting surfaces on the upper extremity function and trunk muscle activity in hemiplegic patients in a sitting position. J Korean Soc Occup Ther. 21, 61-73.